Dr. Martin Weiss has reversed course. He now thinks price inflation lies ahead. This is the equivalent of Steve Jobs announcing: "The future of computing over the next decade is with Microsoft Windows 7." I have waited for this for 27 years. Better late than never. His announcement is here. Dr. Weiss is the son of J. Irving Weiss. I first heard his father at the very first gold investment conference, back in the fall of 1967. It was sponsored by Harry Schultz. At that conference, most speakers predicted an era of price inflation. The lone exception was J. Irving Weiss. He predicted deflation. He recommended being 100% in Treasury bills. I remember phoning my parents and telling them to switch their retirement money to American $20 gold coins: 100% of it. They did. A month later, the British government devalued the pound. The price of gold began moving up. The American price level (CPI) in 1967 was less than one-sixth of what it is today. Shultz's speakers were correct, with one exception. Martin Weiss continued his father's tradition relentlessly until this week. Dr. Weiss in no way waffles. He calls his article "From Deflation to Inflation." They are everywhere. They could be overwhelming. They must NOT be ignored. My question is this: Why now? Why did he ignore these forces for 27+ years, when they were dominant? What is new today? Step by step, with little fanfare and great complacency, we are witnessing a fundamental, global shift that's rapidly transforming the investment scene. . . .
Little fanfare? For a year, we in the inflationist camp have been warning about all of the factors he lists: the Federal deficit. Through August, the federal deficit hit $1.38 trillion, or three times last year's all-time record deficit of $454.8 billion. And in September alone, the administration expects another $200 billion in red ink, bringing the total for the year to $1.58 trillion. The U.S. government's official debt is now at an all-time high of $11.8 trillion, or over $100,000 for each and every household in America. Yet none of this is inherently inflationary. It will shift investments from the private sector to the public sector, but price inflation is a monetary phenomenon, not a fiscal phenomenon. So, the following insight does not apply, either. Perhaps worst of all, the government's unfunded obligations for Social Security, Medicare, and Federal pension payments are also ballooning higher and now stand at an estimated $104 trillion, or $886,000 per household. These figures are accurate. They are also horrendous. But they are not inherently inflationary. Inflation is a monetary phenomenon. Also, none of this information is new. It has been known for decades. I began warning about it in 1976. The best estimates are from Prof. Kent Smetters of the Wharton School at the University of Pennsylvania. In February 2005, he testified before Congress about the unfunded liabilities of Medicare, Social Security, and the other retirement programs. At that point, the unfunded liabilities were over $65 trillion. He projected this at almost $77 trillion for fiscal 2009. I have posted this on my site. I first reported on his testimony in October 2005, in an article on GaryNorth.com: "U.S. Government's On-Budget Debt Hits $8 Trillion on October 20, 2005." Dr. Weiss makes a prediction based on these figures. It drives the Fed to print money without restraint. It pumps up demand for scarce goods. And in the months ahead, it's bound to be the single most powerful pressure point on public policy, financial markets, the U.S. dollar and inflation. Dr. Weiss is repositioning himself after 27 years. This will not be easy. He had a near monopoly in the deflationist camp until Mish showed up. He was known as the most tenacious of the deflationists. Through decades of rising prices, he never changed his tune. Now he has not only changed it, he is writing new lyrics. This means that, instead of using Japanese yen to finance the carry trade – borrowing low-cost money to buy high-yielding investments – international investors will now start using U.S. dollars to finance the carry trade. It means that, instead of the dollar being a magnet for frightened money, it is becoming precisely the opposite – a source of financing for the risk trade. Yet this does not in and of itself guarantee price inflation. Inflation is a monetary phenomenon. The question is the comparative expansion of money. What happens in international currency markets is less important to prices in the United States than this question: Are American bankers likely to remain frozen in terror, with $700 billion in excess reserves held by the FED? If and when they begin lending this money, will the FED sell assets, thereby winding down the doubling of the monetary base, September 2008 through December 2008? In the days ahead, my team and I will give you step-by-step instructions on how to protect yourself – and profit. I agree with his conclusions. I do not agree with his theoretical analysis. The Federal deficit is relevant as a motivation for the FED to expand the purchase of Federal debt. It is not relevant as a stand-alone factor in price inflation, except at the margin. Pouring money into T-bills will reduce production: "the same amount of money chasing the same amount of goods." Prices would have dropped a percentage point or two. With static or falling production, prices will not fall. But this is not the kind of price inflation that threatens us. The thing to look for is not government debt, which always rises. Look for signs of recovery of bank lending and a reduction of the $700 billion in excess reserves held by commercial banks at the local Federal Reserve banks. This is what will determine the rate of monetary inflation. If the bankers remain petrified of this market and refuse to lend, then the FED's expansion of the monetary base will remain neutralized. This is what affects the M1 money multiplier. The multiplier fell off a cliff last year. It has stabilized this year. So has the FED's purchase of assets, i.e., its balance sheet, i.e., the monetary base. The price level is flat today. We are not in price deflation. We are not in price inflation. We are where we have not been since the mid-1950s. The FED gets credit by the media for having avoided a financial meltdown last year. It also gets credit for stable prices. It does not get blamed for rising unemployment, despite the fact that the government has charged the FED with these two tasks: maintaining stable prices and high employment. The FED is now coming under more scrutiny from the public than ever before. There is pressure on Congress to pass Ron Paul's bill, H.R. 1207, which would require the FED (a government agency) to submit to audits by the Government Accountability Office. This "shocking" proposal is being fought tool and nail by the FED. The thought of such a thing! Why, it would imply that the government is in charge of a government organization. What is Paul thinking of? On this issue, Paul is finally being taken seriously. This is helped by the fact that his book, End the Fed, released on September 16, was #29 in sales on Amazon on September 21. This list includes fiction books. That a book on such an arcane topic sells this well is unexplainable for the mainstream media. The FED has been beyond serious criticism in the press since 1914. This represents a change in public opinion. Not the broad public, of course. The broad public is represented by Jay Leno's "Jaywalking" segments. I mean the literate public. The visible disaster that began in September 2008 can no longer be concealed. Ron Paul was the only public figure in the United States who had built a career on criticism of the FED in particular and central banking in general. His decades of persistence have paid off. The Federal Reserve is still the primary government agency that protects the real power in this country: large-scale commercial banks. It is the enforcement arm of the large commercial banks, none of which has ever been allowed to fail. It will successfully avoid the fate that Dr. Paul has recommended. But it is under scrutiny to a degree that its Chairman has never seen before. This will not change. It will escalate. WILL THERE BE MASS DEFLATION? 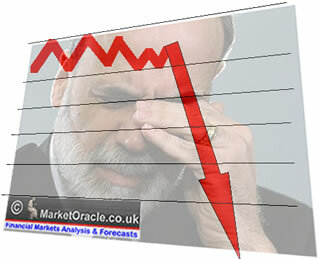 Will we see consumer prices falling at 10% per annum? No. Will we see prices falling at 5% per annum for five consecutive years? No. What about in one year? No. I have been saying this in public since 1964. I have argued that the central bank will not allow large banks to fail. This means that it will not allow the fractional reserve process to implode through bank failures and the contraction of the money supply. So far, I have been correct. Ever since J. Irving Weiss gave his speech at the first gold conference in 1967, there has been a tiny minority of hard-money non-economists who have predicted price deflation. They always have had a few believers on their mailing lists. They have never had many. Deflation has been the bugaboo of Keynesians, not hard-money investors. The deflationists – Prechter excluded – have always recommended holding gold, an investment unsuitable for deflation. This is why they have continued to operate in the hard money camp. That someone in the hard money camp may predict price deflation of a percent or two for a year or two does not constitute his membership in the deflationist camp. On the other hand, when someone says price inflation is the greatest threat for the time being, this does constitute a defection from the deflationists' camp. The departure of Martin Weiss from the besieged camp of the faithful deflationists should bring forth from them a series of systematic analyses on "Why Weiss is wrong." If it doesn't, then the deflationist camp is in big conceptual trouble.